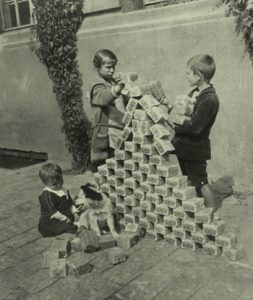 Why do Germans remember the Weimar hyperinflation? David Beckworth recently interviewed1 (podcast) professor Jesús Fernández-Villaverde. Among other things, they discussed the hyperinflation in the Weimar Republic, i.e. Germany after World War I. 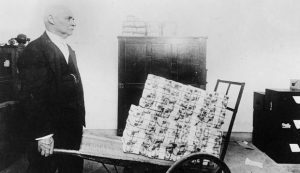 The economists ponder why a hyperinflation that occurred in 1923 has had such a large impact on German economists and central bankers, even to this day. After all, the NSDAP rose to power in the 1933, at a time of mass unemployment and austerity. This was almost a decade after the hyperinflation ended. The professors get to the hyperinflation at 8:20 into the conversation. Fernández-Villaverde tells the story of how inflation got out of hand when French and Belgian troops occupied the Ruhr2. The Weimar government encouraged workers to resist the military occupation. Strikers were paid with money freshly printed by the Reichsbank, the German central bank. The combination of no real economic production with an increasing amount of Papiermarks tanked the purchasing power of the currency. The hyperinflation began. For Germans with savings, this was a disaster. All the money they had worked for became worthless. Frederick Taylor describes this period in his book The Dowfall of Money: Germany’s Hyperinflation and the Destruction of the Middle Class. It is clear to anyone who reads Taylor’s book how the aftermath of the Great War fuelled nationalist resentment in Germany. Now, the topic of this post is why the Weimar hyperinflation has been embedded so deeply into the German consciousness. Fernández-Villaverde makes two credible arguments, starting at 15:30 into the interview. The first is that hyperinflations wipe out all savings with a fixed nominal value3. In contrast, the pain of the Great Depression was spread more unevenly. 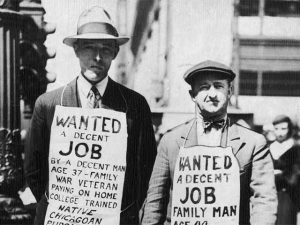 During the early 1930s, the unemployed suffered the most. Workers who kept their jobs profited from falling prices. The second argument is that German economists see the hyperinflation and what followed in the years after 1929 as a continuum. I agree with these explanations, but I would argue there is a more basic reason for why the Bundesbank remembers the hyperinflation. 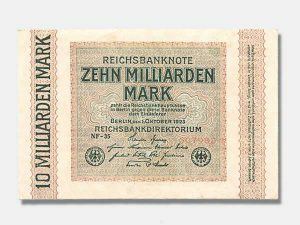 So the Weimar hyperinflation was clearly a monetary problem, and it was a German problem. 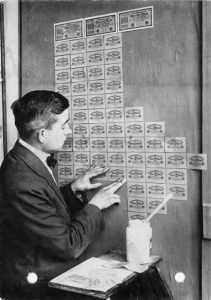 Who is to blame for the hyperinflation? This is the easiest detective story ever. The culprit printed its name on every piece of evidence: the REICHSBANK did it! 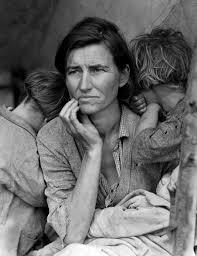 There is no obvious visual link between the Great Depression and money. 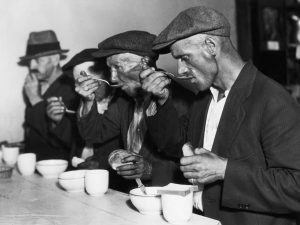 Furthermore, the Great Depression was not confined to the U.S. Like an epidemic, it struck industrialized countries around the world. Since the United States have not had a hyperinflation, American macroeconomists tend to be more concerned about the Depression. But not everybody agrees on the causes of the Great Depression. Or on the role played by the Federal Reserve. It is no mystery to me why people at the German Bundesbank are more preoccupied with (hyper)inflation than Americans are.5 Their institutional predecessor enabled the Weimar hyperinflation. The Great Depression seems more like an international economic catastrophe, out of the control of the German (or any) central bank. But why do non-German economists always talk about the Weimar hyperinflation? It was not the first, nor the most extreme hyperinflation in history. I’m speculating here, but I see three reason. The first is numeric, the second has to do with the status of Germany, and the third with the existence of good photograps. What do I mean with the numeric reason? More than a century earlier, revolutionary France had its own hyperinflation. At the peak, French prices quadrupled in one month’s time. European countries at both sides of the First World War had experienced significant inflation during the conflict. After the 1917 Bolshevik Revolution, Russia suffered from hyperinflation for seven years. Because the early Soviets redenominated the ruble several times (i.e. they dropped a few zeroes from the currency), their banknotes never had astronomical numbers like the bills in Germany. But Germany was the first country in history to go ‘full retard‘ in terms of denomination. At the end of 1923, you needed 4.2 trillion mark for one US dollar, a trillion times more than in 1913. The numbers were just ridiculous. Imagine buying groceries today and having to pay a hundred thousand billion euro… Later hyperinflations surpassed the madness of Weimar Germany. Hungary (1946) is the absolute champion, followed by Zimbabwe (2008) and Yugoslavia (1994). This brings me to my second point, the status of Germany. While it had lost the war, Germany was still a large and technologically advanced country. The same cannot be said of worse hyperinflators like Hungary or Zimbabwe. Austria went through a hyperinflation in 1922, but at that time the rump state was but a shadow of the former Austro-Hungarian Empire. While Russia was a larger country than Germany, it has long been seen as less sophisticated than Western nations6. So maybe hyperinflation was something you could expect from those Asiatic barbarians, especially if they were also communists. Besides, the Russian people had more pressing concerns, as the Soviet hyperinflation mostly coincided with the Russian Civil War. Weimar Germany managed to botch up its currency in peacetime. Thirdly, although it had a lot of economic troubles, Germany was a relatively prosperous country. Private citizens owned high quality cameras produced by renowned manufacturers. The prevalence of cameras in 1920s Germany left us with the pictures I included higher in this post. Thanks to a couple of iconic images that are endlessly reproduced, the collapse of the Weimar currency has become the archetype of hyperinflations in the mind of people around the world7. Try it for yourself: you cannot find anything similar for ‘Soviet hyperinflation‘ on Google Images. In conclusion, it’s no surprise that foreign observers were fascinated with the monetary trainwreck that was Weimar Germany. Almost a hundred years later, we are still talking about it. 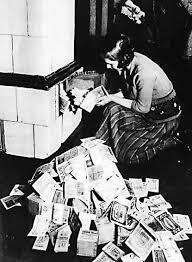 The Weimar hyperinflation is mentioned in my book Bankers are people, too: How finance works . The entire Macro Musings series is interesting if you’re into macroeconomics! He misspoke in the interview, saying Rhine instead of Ruhr. The price of stocks and real estate rose together with the inflation. The real ‘winners’ of the hyperinflation were those with foreign currency. For them, German goods and services became incredibly cheap. Others even made a kite out of money! Also, the Bundesbank has a good track record preserving price stability. One could debate if Germany was really a Western country, but that would lead us too far. By the way, Germany has the same PR problem for the Nazi era. There is an abundance of sharp pictures from that time. The crimes of the communist regimes are less documented because people were too poor to own cameras. What I do not understand: in the last post (ECB should give money directly to citizens) the point is made for what is obvious from the title. How what that be different from what the Reichsbank did, as described in this post? Why was it bad for Reichsbank, but should work for ECB now? I do not get that logic. “How what that be different “: read “what” as “would”, sorry. Thanks for your comment! I got the idea to write this hyperinflation post after I got some comments similar to yours in response to the helicopter money article. As I see it, the economic context is everything. The German economy was in ruins after the First World War. High inflation had become the norm. The demand from extra cash could not be matched by production of real goods (especially as coal miners and railroad personnel were paid not to work!). As a result, prices spiraled out of control. In contrast, the euro area as a whole has had very low inflation in the past years (see: http://sdw.ecb.europa.eu/quickview.do?SERIES_KEY=122.ICP.M.U2.N.XEF000.4.ANR ). Many people (mainly in southern Europe) want jobs, but cannot find them. Companies have the capacity to produce more, but consumers are reluctant to spend money. So, counterintuitively, now would be a good time for the ECB to give money to the people. As Eric Lonergan and I wrote in our op-ed at EUobserver, the ECB should only be allowed to distribute helicopter money under strict conditions, inflation being one of them. You make some points. But I still see at as a risky proposal, especially as the ECB has shown in the last years that “strict conditions” can be softened up quite easily under certain conditions. These are really interesting times. why this problem has a very long term effect to this day since 1923?